MASKerade: CASE Study175, Muse 51 - Happy 50th Birthday! CASE Study175, Muse 51 - Happy 50th Birthday! So fun...and happy 50th to your sweetie! 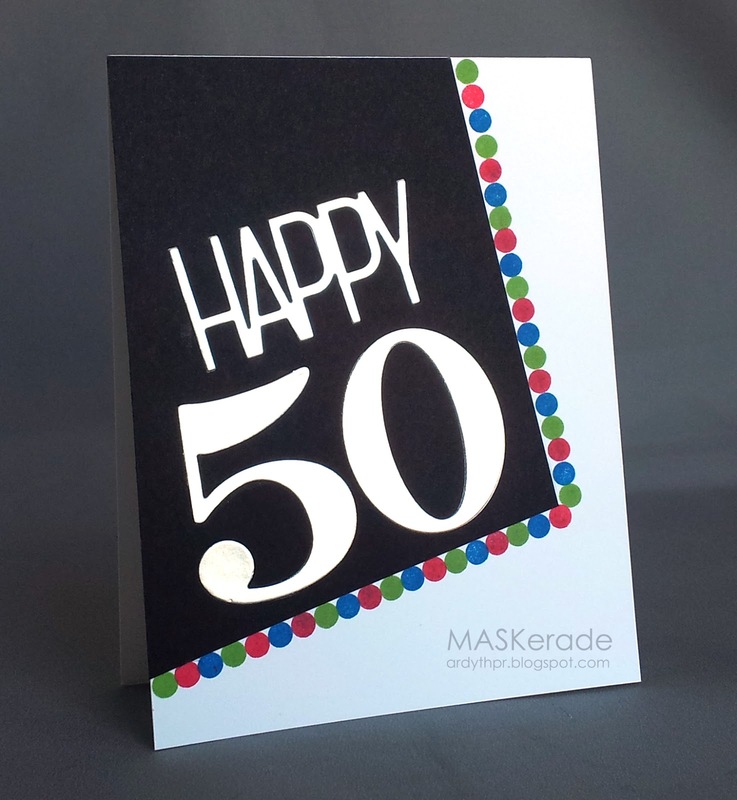 This is a fabulous card, love the big bold greeting! Well, there's no chance of him forgetting the big number :) Love this big, bold statement card. Love the colorful framing -- great card!! Happy,happy 50th birthday to your hubby Ardyth. His card is fabulous! Big and bold....so appropriate for a fellow who is darn near 7'tall (or close to it!). ...and the individually stamped wee circles...AMAZING!!! What a great take on the challenge! Happy Birthday to Michael! He'll love this card. Fabulous bold design, Ardyth! Love it! WOW - A beautiful bold take on the challenge. A great masculine card. PS. I cut up ordinary coloured A4 printer paper that comes in a ream bought at the local supermarket. Works perfectly for envelopes. I also use the plain white too. Big and bold and amazing how you stamped all of those tiny circles with such precision! Fabulous birthday card. Love your take on the inspiration card. and, those dots--how did you get them all stamped so perfectly? Happy Birthday to your DH. Great take on the inspiration! I hope your husband's birthday is very happy.